Rich was a 27-year-old Democratic National Committee staffer. He was returning home after an evening of socializing when he was shot in the back, at approximately 4:19 a.m., on July 10, 2016. 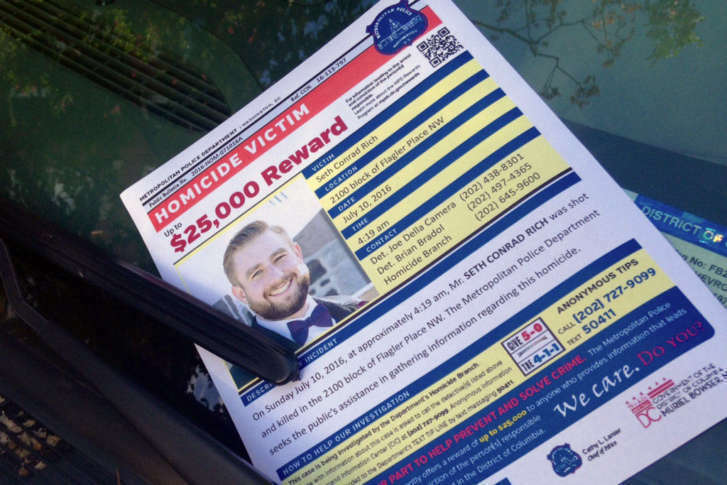 The unsolved murder has been the focus of several conspiracy theories that suggested he was killed because of his work at the DNC, theories that police and Rich’s family have declared unfounded. After a year of investigation, Newsham said evidence of value has been difficult to come by. Newsham is hopeful that the crime will be solved by a tip from the public. In a statement, Rich’s parents and brother said several scholarships and programs have been established to honor his dedication to public service. “Seth’s legacy of public service, his determination to make the world a better place and his genuine desire to foster engagement among Americans of all ages persists, and it serves as a comfort to our family at a dark time,” said Mary, Joel and Aaron Rich, in the statement. In a final paragraph, the family alluded to conspiracy theories which have perpetuated online and on the air. “We are compelled to address those who are claiming to help by undertaking private ‘investigations,’ staging re-enactments, or traveling to Seth’s old neighborhood to perform citizen interviews,” wrote the family. “When I see stuff like that, I really feel for the family,” said Newsham. “There seems to be a small group of folks out there that’s not really being respectful of the family and their wishes, and they continue to do those kinds of things.